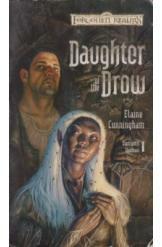 Daughter of the Drow by Elaine Cunningham, Sci Fi. Book is in good condition, all pages intact. Born to a treacherous, backward drow elf society below the earth, Liriel Baenre has grown disenfranchised with her people. Feeling a call to something better, Liriel flees to the sunlit world above, but her former people pursue her ceaselessly and her one hope for salvation may come from an enemy. Part of the Forgotten Realms franchise.